Convection burn-off ovens are used in various industries for heating parts. However, these ovens have serious drawbacks, such as a low rate of heat transfer, and an inherent requirement of heat transfer. Some convention burn-off ovens also cause uneven heating. This means the load is unevenly heated, which leads to damaged parts. Also, uneven heating creates cold spots in the enclosure of the oven. The ACE radiant tube ovens are designed to overcome all these challenges and offer efficient results. These ovens help achieve excellent heat transfer (maximum) without producing cold or hot spots, as well as achieve energy savings. Thus, these ovens are also known as heat cleaning ovens. The oven provides uniform heating all over the part. This is possible only due to the lower temperature of the air surrounding the oven. The heater offers instantaneous heat delivery, because unlike other contemporary heaters, it doesn’t require burning the air in the main firebox in the burner for heating the load. This is because the main firebox in the burner is eliminated. It means the pick-up-factor is zero. As, the temperature of the radiant heat tube surface is only 100°F (37ºC). Thus, it will cause no damage to the load, even if it remains in close proximity for a long time. When the heating system is at a setpoint temperature, the load acts as a heat reservoir or a heat sink, thereby minimizing temperature sag. There are multiple holes on the right and left sides of the radiant tube. Convectional heat is emitted from these holes. The primary chamber heating system is easy to install. The following special features of the ACE heat cleaning ovens make them unique. Layer Wall Protection: There is an 11 Ga corrosion-resistant barrier within the oven. The steel enclosure contributes to the performance, and improves shelf life of the oven. Also, there is an optional 4" insulation, which ensures that the outer temperature of the oven does not exceed 140°F. This insulation is covered by a 16 Ga expanded metal, which provides additional protection. Diagnostic Panel: All ovens in IRI/FM series are equipped with Honeywell combustion flame safety controls. These safety controls provide up to 127 checkpoints for diagnosis. Durable Construction: The ACE system is made from high quality durable materials. These materials help ensure lasting performance, as well as long lifetime. We have used 11 Ga steel for the construction, which is superior compared to the regular 14 Ga steel used in other ovens. One Touch Control (OTC): This is an innovative self-adjusting control system. This is used to monitor the combustible vapor in the oven. Also, it helps maintain them at the safest level. All possibilities of operational errors are eliminated, because this system doesn’t require an operator’s input. The system adjusts the cycle time to the weight of the combustible, as well as non-combustible load. Only the push of button is needed to automate the process, or shut the oven. Water Suppression Systems: The oven is provided with primary and secondary water suppression systems to prevent fires, which are caused during run-away. Safety Features: The ACE oven is equipped with a comprehensive range of safety features, including fail-safe water check system, door lock, press relief hatch/hatches, high-limit temperature switch, over temperature water suppression systems, emergency shut-down, and flame safety controls. Automatically Programmed Timing Cycles: This is one of the major benefits of these ovens. The timing cycle is automatically adjusted to the time required to clean the load. This helps an operator to remain carefree about the timing cycle. Also, he needn’t worry about manually tracking the time required to clean the load. Heat Cleaning without Pollution: The oven features a significant afterburner chamber, which is designed to offer excess air for the complete smoke, and odor combustion. Generally, harmless by-products are released into the environment. This helps users conform to EPA air emission standards. A Comprehensive Range of Accessories at Low Prices: We allow clients to select from a comprehensive range of accessories at extremely low prices. There are more than 50 optional accessory items available with us. 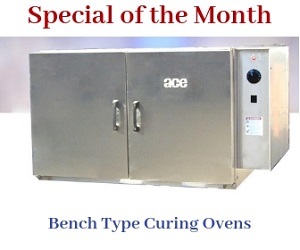 Technical Assistance: ACE offers free technical assistance on all ACE radiant tube ovens. All the above-discussed features ensure high-performance of a burn-off oven on a low budget. For more details, please contact us at the earliest.